Forty one out of 140 entries made it to the final nominations list of the Globe Davao Media Excellence Awards (DMEA) to be held on November 21, 2013 at Marco Polo Hotel Davao. The Awards pays tribute and gives recognition to print, broadcast, and digital media practitioners who have excelled in their respective fields. “We are very happy over the great interest and overwhelming response to our call for entries. It was really a challenge doing the shortlist as there are so many of them that are worthy as finalists. 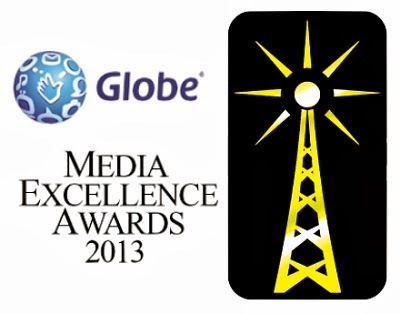 They are all deserving of an award,” said Globe Corporate Communications Head Yoly Crisanto. The finalists will vie for nine award categories namely: Reporter of the Year for Print, Feature Story of the Year for Print, Columnist of the Year, Photojournalist of the Year, Reporter of the Year for Television, Feature Story of the Year for Television, Reporter of the Year for Radio, Blogger of the Year, andSocial Media Advocate of the Year. Feature Story of the Year nominees include: “Watersheds, our treasures”, Stella Estremera, Sunstar Davao; “Bringing education to Manobo kids,” KarlosManlupig, Philippine Daily Inquirer; It’s about survival”, Ivy Tejano, Sunstar Davao; “The living light of Pegalongan,” Neilwin Joseph Bravo, The Edge Davao; and “HM4HB: Ups the ante in breastfeeding,” Marianne Saberon-Abalayan, Sunstar Davao. On the other hand, Olan Emboscado is the only one who made it to the Social Media Advocate of the Year with five nominated entrees. The judges’ decisions for print and broadcast categories shall be based on the following criteria: • Content (50%) Adherence to truth and responsible journalism as manifestedintheaccuracy,fair,andbalancedpresentation, and depth of reporting. • Style (25%) Ability to communicate clearly and effectively as shown by the writing style, clarity, logical presentation of issues, coherence, and fluidity of ideas. • Social Impact (25%) Involves the impact of the articles on effecting change. For bloggers, the criteria are: • Consistency of content on the advocacy (50%) • Reader friendly presentation and design of content (20%) • Social Impact (30%). For social media advocates: • Content (50%) Consistency of content on the advocacy (50 percent) • Reader Engagement (20%) Number of Comments to the post • Social Impact (30%) Retweets, Shares, Favorited, Likes Prizes and Awards. Congrats, we appreciate it. You can do more for this. vkonnect help you on board. It’s very little thing capability to deliver which will Rolex running watches can be expensive. rolex replica sale On a large number of occasions some people usually tend to cost you thousands and thousands, possibly even lots. tag heuer replica Though thankfully they can end up exceeded from a new release with the several other. cartier replica sale It is therefore worthwhile purchasing a exquisite, despite the fact that pricy Rolex sit back and watch, to obtain it for many years including result in the application being a antique. breitling replica However is smart for people who wish to order decent running watches purchasing a powerful implemented Rolex. One don’t comprehend how come this is often this type of a great idea? fake patek philippe Continue on analyzing and you will definitely discover why focus on purchasing pre-owned and even save up. Another thing in Omega running watches enhancing ones own worthwhile is definitely the traditional which inturn they are surely built through.